Today I received a comment from Thomas who has a Facebook page for supporters of Laura Dekker. He pointed out that I had incorrectly stated in yesterday’s Blog that she would be attending the Amsterdam Boat Show in September. In fact she will be in attendance at the Boat Show from 1st to 6th March. This miniature inflatable catamaran does indeed look like a load of fun. I like the fact that it can be packed in a bag which measures 1,350 x 300 x 400 millimetres and the total weight is only 35* kilograms. There are 3 options from which you can choose: the ‘Standard’ boat with one sail; the ‘Super’ version with a jib to go with the mainsail, or the ‘Sport’, which is like the ‘Super’ but it has a furling jib and a lighter mast. 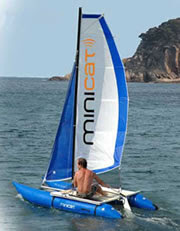 This 3.1 metre by 1.4 metre catamaran that can be sailed by one or two people. If you want more details, search the websites listed below. *Depending on the version, the weight of the package can be between 35 and 38 kilograms. An informative website for Laura with up to date news and good photos. Thanks for the link Paul. I'll have a look and maybe do more reseach on inflatable sailing catamarans.